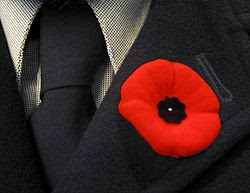 I pin a red poppy to the collar of my jacket. I think about all the military men and women over the years that I've had the pleasure of knowing. Today is a tribute to them and the sacrifices they've made in the past and present. To our troops who are away from their loved ones, to those who will soon depart, and to those that never returned home: thank you.